Life is not a rehearsal, we will live it only once. So it seems obvious to me that we must make the most of our time and try to enjoy every moment. That’s a healthy personal philosophy by which to live I think. Literally enjoying every moment is not possible of course. There will be good times and, inevitably, there will be bad times too. You can’t appreciate the former without experiencing the latter. Nevertheless I am a firm believer in the notion that you only get out of life what you put in. If you just drift along, with little effort and a lot of unwise choices then your future is likely to be unexciting at best, unless you get very, very lucky. Whereas making some effort to realise your full potential; deciding what you want and pursuing your dreams with hard work and determination; this approach is more likely to lead to better life experiences. Ask yourself this, “When I’m old and frail and reflecting on years gone by, how will I feel if I’ve wasted those years?” The problem with time is that once it’s gone, it’s gone. You can’t get it back. Surely time is our most precious commodity? The answer to these questions matter only to you. You’re the one who must look at yourself in the mirror each day. You’re the one who must look yourself in the eye. You may fool other people with tales of what might have been but you can’t fool yourself. Deep down you’ll know whether you tried or not. You’ll know whether you made a lot of choices you wish you hadn’t made. You’ll know whether you cheated yourself. And regret lies at the heart of cheating yourself. So my advice would be, don’t do it. When you look in the mirror each day, ask yourself some searching questions. Are you making the most of your natural talent, whatever that might be? Are you looking after your body and your mind? Are you developing habits which will be detrimental to your wellbeing? Are you looking after those who matter most to you? Can you reflect on your life so far with at least some degree of pride and satisfaction? If you’re getting too many negative answers, then perhaps it’s time for some changes in your life? 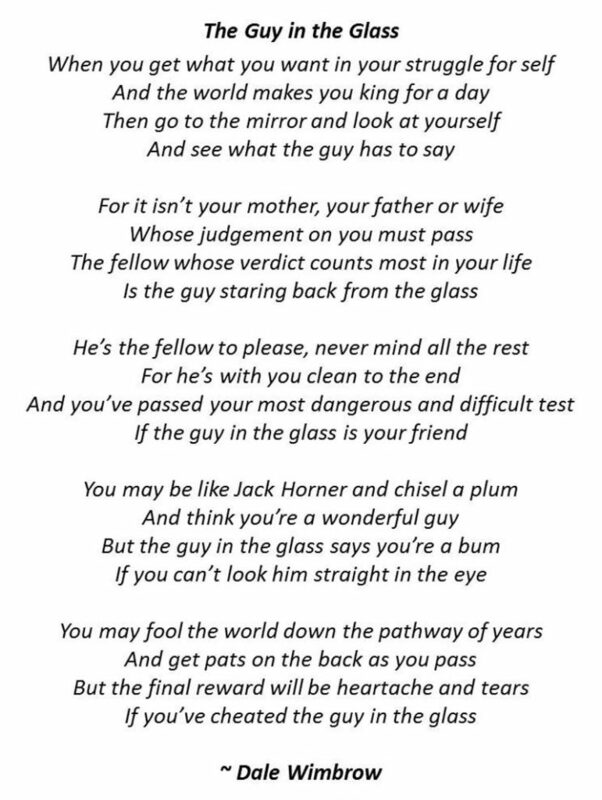 In reflecting on this idea, I was reminded of a poem which is included as part of the process Alcoholics Anonymous use to help their client base. However I think it’s relevant to us all, regardless of whether we’re alcoholics or not. The underlying message is that your behaviour should be consistent with the need we all have to be able to look ourselves in the eye.